Tucked away, behind the bare branches of another plant, I discovered a little gem a few days ago. I rescued this little plant. It was nothing more than a foot and a half of vine that had been torn away from a trellis, only to be dropped and then stomped on several times by passersby. I gave it some love together with soil, water and fertiliser, and hoped it would like the position where I placed it on the fence. In time I could tell this was the case, and over the last ten months, it has been growing and glowing. Its fat little waxy leaves look positively plump and proud. I believe this is Hoya Carnosa, and it obviously loves where it has been positioned in its pot. 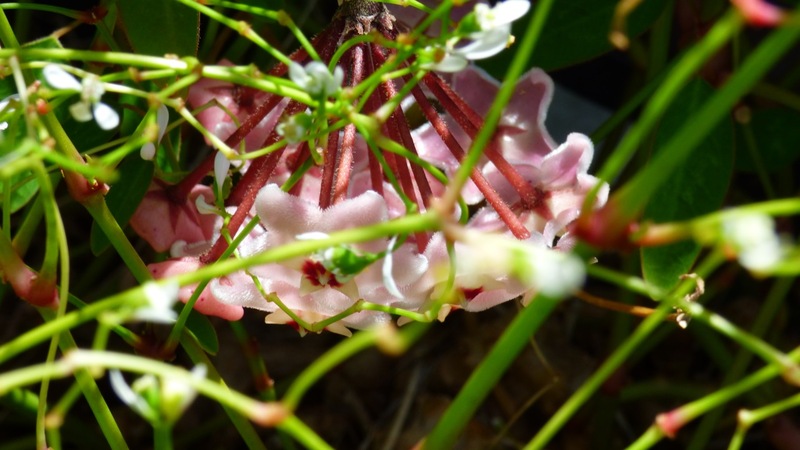 Hoya flowers appear clustered from a stem that hangs down from the vine. So in order to easily appreciate the flowers, you have to position the plant somewhere high up or, as in my case, get under it to see them when they do appear. You can see there are still a few blooms yet to open, but I’m delighted to report, there are more flowers to come with one shoot currently sprouting four clusters. I’ve called this plant ‘Peppermint Patty’ in honour of my Aunty Pat. It was after she passed away that I rescued that little piece of vine from her backyard. At the time my cousin said “Oh, look at you. Patty would be so proud!” Rescuing plants was something my aunty loved to do and I’m glad I rescued this one. This certainly is one happy little Hoya. Sometimes the magic of my green thumb surprises even me. This morning, all those blooms are open, and with the abundance of nectar those fuzzy little flowers produce, the ants are having a field day. There must be this secret kindred plant rescue society 🙂 and I’m glad to be a member. I have one in a hanging basket which is similar to yours . You have motivated me to fertilise it .It has given a few bunches of flowers. You are amazing Clare. Wonderful rescue! Now please come and help me make flowers grow in the Southwest! 🙂 Deal – just have to save some money for a flight. My mom had one of these (exactly like that, as a matter of fact) that her sister sent home with her from Ohio probably clear back in the 60’s or 70’s. She never could get it to grow worth a hoot, If she knew what the name of it was, she never told us. It was hanging in a west window with the light blocked out, all straggly and forlorn looking. But when we cleaned out the house when she passed in ’98, I couldn’t bring myself to throw it out. I brought it home, repotted it, and hang it in my kitchen. 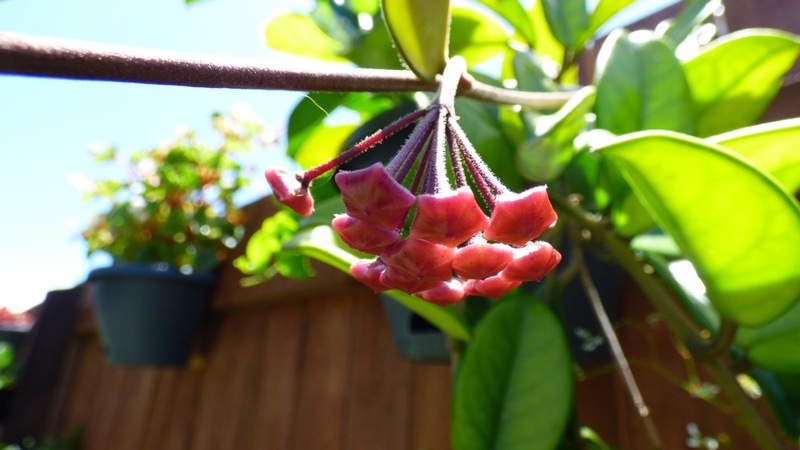 Eventually through a post I did about it, I found it was a Hoya. And last summer, after 19 years, it finally got it’s very first blooms on it! 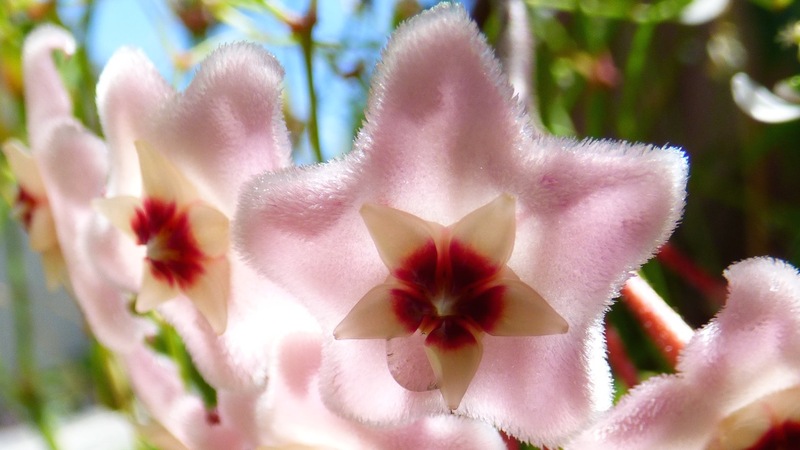 And guess who told you it was a Hoya? I remembered 🙂 and I often think of you when I’m watering my happy little Hoya.